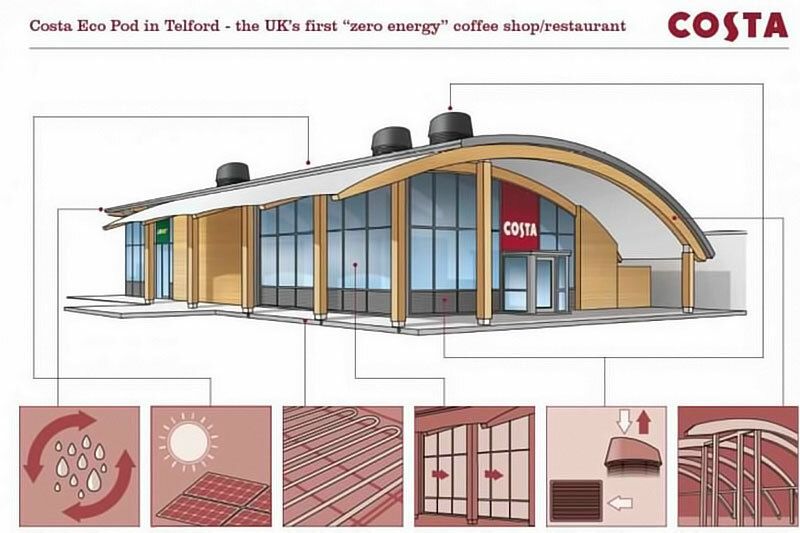 In conjunction with Benson Signs, Costa delivers its first zero energy coffee shop. At Benson Signs we have long championed the concept of energy efficiency, renewable energy, and sustainability. It makes sense not only for us as a company, but most of all, for our customers. If we are efficient it lowers our overheads, and makes us more competitively priced. If we manufacture our signs to run on the most efficient technology it reduces the running costs for our customers. It’s a win-win situation. One of our biggest clients is Costa Coffee, and we have been working with them for nearly 20 years. As a large organisation, under current EU and UK legislation, Costa has legal duties with regards to its energy consumption and, in conjunction with parent company Whitbread holding the prestigious Carbon Trust Standard. Costa is always looking at new and innovative ways to improve its efficiency, and reduce carbon dioxide emissions. See the initiatives that Costa have implemented in helping create a better environment. However their latest is probably the boldest yet, and it is something that Benson Signs is extremely proud to have contributed towards. On the edge of town, just outside Telford, Shropshire, sits an unassuming retail estate with the usual mix of names found in estates across the UK. 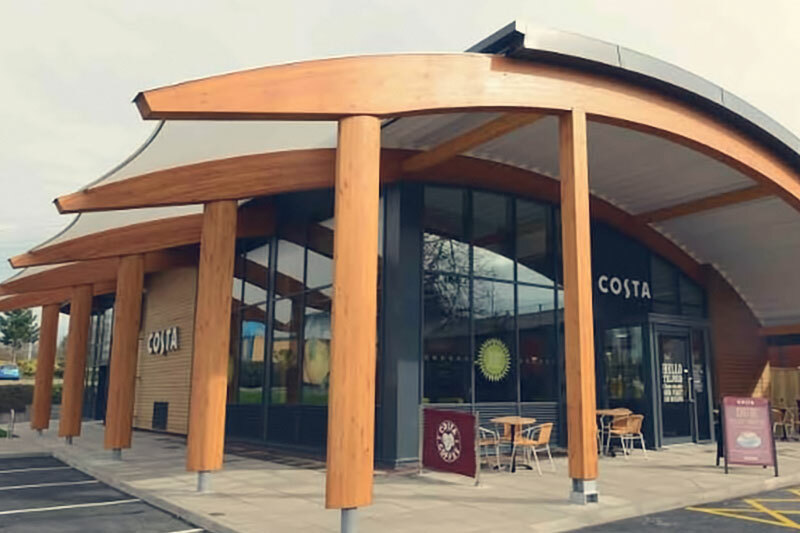 Amongst the parking spaces and paving stones however, sits a little gemstone, clad in modern glazing and warm timber; the Costa Eco Pod is setting new standards in retail design and operation. In conjunction with Hammerson, who operate the park, the new eco pod features a whole host of low-carbon technologies and design, including sustainably sourced timbers for the building frame and cladding, solar PV embedded into the roof, passive ventilation to cool and heat the building when required, rainwater harvesting and a highly insulating glazed façade. But where do Benson Signs fit in? Well, as mentioned previously, we have over 10 years of experience in ever-increasing sustainable manufacturing, and all our philosophy, methods and techniques are perfectly demonstrated in this one Costa site. For example, where possible the aluminium we use for the construction of our signs is from recycled sources, and the timbers we use in manufacturing our picture frames is from FSC accredited sources. Large items are powder coated instead of painted, which produces virtually no harmful air pollution. 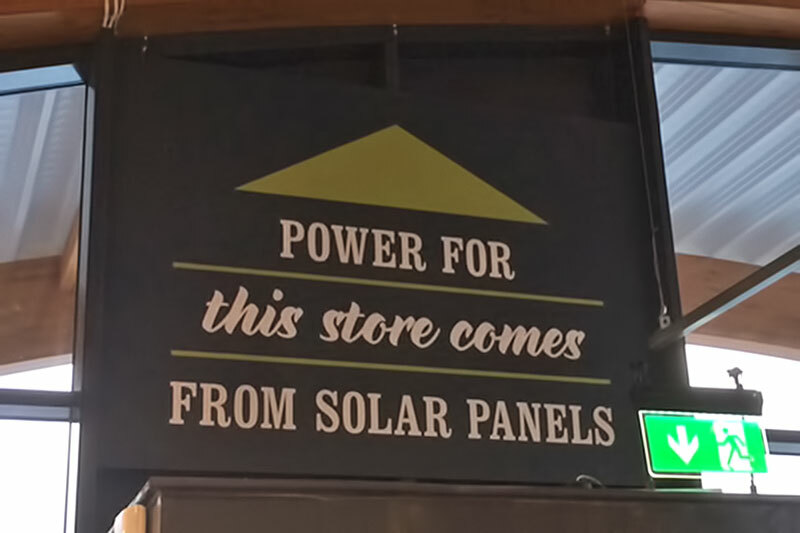 Our factory is powered from 100% sustainable electricity sources, both from our grid supply, via partners Good Energy, and our onsite 25kW solar PV array. Our offices and workshops are heated sustainably from carbon neutral renewable biomass, and around 95% of our lighting is LED. All of these measures result in dramatically reduced embedded carbon content in our products, even before the signage is installed or switched on! Furthermore, utilising energy efficient LED lighting in our products results in lower operating costs and contributes to the zero carbon status of Costa's eco pod. Environment, Health & Safety Coordinator, Graham Barker said: "When I first came to Benson Signs with my previous employer in 2007 to carry out a carbon footprint assessment, the philosophy of the company was clear, as was the direction the company was taking with its green ambitions. Now I am proud to say that, as an employee, I have been part of the drive to even greater green achievements. Full credit however has to go to Chris Benson, our Managing Director, for his total commitment and belief in the benefits to the company of our environmental programme. 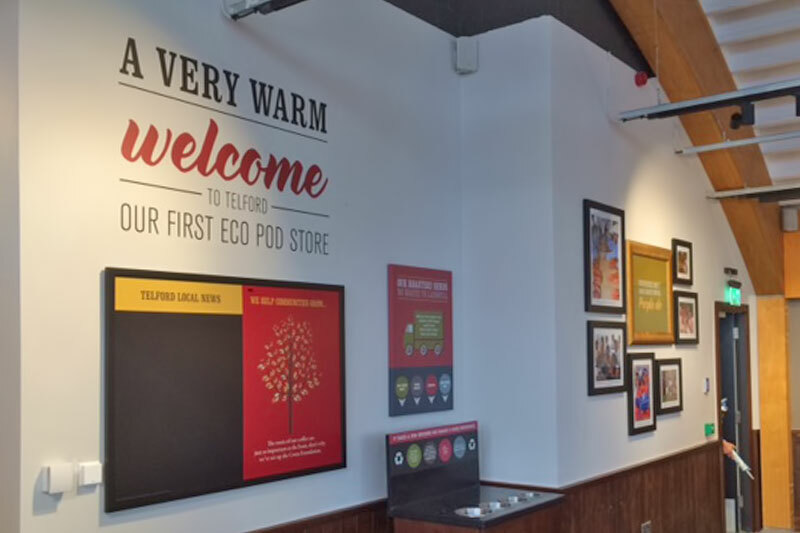 Our involvement in Costa's eco pod project and ongoing partnership with them is an endorsement of our achievements to date and, hopefully, the next step in our green journey". Benson Signs manufacture signage for Costa Coffee's zero energy coffee shop.